At the beginning of June, we threw down the gauntlet for a wellness challenge—but the point, of course, was that we left the details up to you. How do you want to improve yourself? What small steps do you want to take for your overall well-being? #MyNextThirty is a social movement that encourages you to set your sights on a wellness goal—big or small—and commit to it for 30 days. Whether you're aiming to drink more water or try an intimidating workout class (the latter, in my case), the idea is to self-improve and build positive habits, one small, totally doable step at a time. But in that spirit, we've decided to up the ante and get to know our community a little better by presenting a series of in-studio fitness events in New York and Los Angeles. Last week brought us to Orangetheory's West Hollywood studio in celebration of celebrity nutritionist and THE/THIRTY contributor Kelly LeVeque's new book, Body Love ($18). Between the tough sweat session and a highly informative Q&A with LeVeque shortly after class, the evening was certainly action-packed. Find out how it all went down below. It was fitting that LeVeque chose Orangetheory to host the evening's festivities—as she explained before class, the dynamic workout is one of her all-time favorites and perfectly aligned with the message of her new book, Body Love, which is all about the science of optimizing our nutrition habits to find the best-feeling version of ourselves. 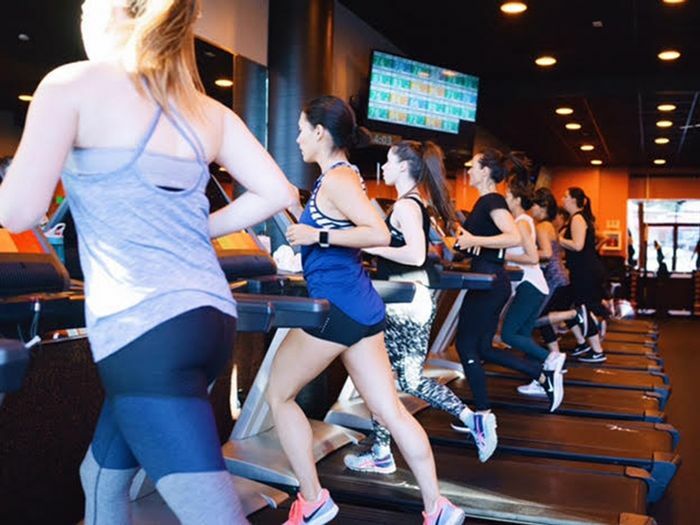 OTF offers that philosophy in workout form: Each 55-minute class consists of a series of heart-pumping intervals, with the aim of maximizing the number of calories and amount of fat burned long after class has ended. In other words, efficiency was the theme of the night. I was personally a little nervous, as it was my first-ever OTF class—and as someone who gets her cardio from fast-paced yoga classes and regular hiking, the prospect of giving my all on the treadmill was somewhat intimidating. But the majority of the event's attendees were also first-timers, so we were all in it together. In the end, I had little to worry about—the workout was as fun as it was tough (read: very). We swapped time between the treadmill, water-rowing machines, and weighted floor exercises. The kicker (as is the OTF way) was that we all had heart monitors strapped to our chests with our rates projected onto a large screen, all to ensure that we were maintaining as much of a burn as possible. This might seem intimidating, but I was surprised to find that it wasn't at all—if anything, it kept me especially motivated to push even harder and best myself. But I won't pretend I wasn't thrilled when it was time to stretch, wipe away the sweat, and head upstairs to regroup, relax, and chat Body Love. Before diving into a discussion with LeVeque, attendees sipped on juices from Juice Served Here and Icelandic Glacial water, and treated themselves to cryotherapy facials provided by Next Health. LeVeque and I kicked things off with a talk covering everything from how Body Love came to fruition to how to stay motivated and some of the most persistent nutrition myths she encounters on a regular basis. (For example: According to LeVeque, we don't actually need to be that worried about coconut oil and should keep it in rotation in moderation.) And when we opened the Q&A up to the entire room, we were pretty floored by the insightful questions and comments everyone offered. But then it was time for some much-deserved sleep, and we sent everyone on their way with gift bags packed with goodies from Juice Served Here and Honest Beauty, as well as an ultra-soft tee from Electric & Rose, which provided LeVeque's outfit for the evening. Suffice to say that we packed a lot into two hours—and we already can't wait until our next #MyNextThirty wellness party. Want in? Keep an eye on Byrdie's Facebook page and opt into our email list (on our sidebar) for updates on upcoming events in your city.